This dish screams fall!! Delicious and comforting. 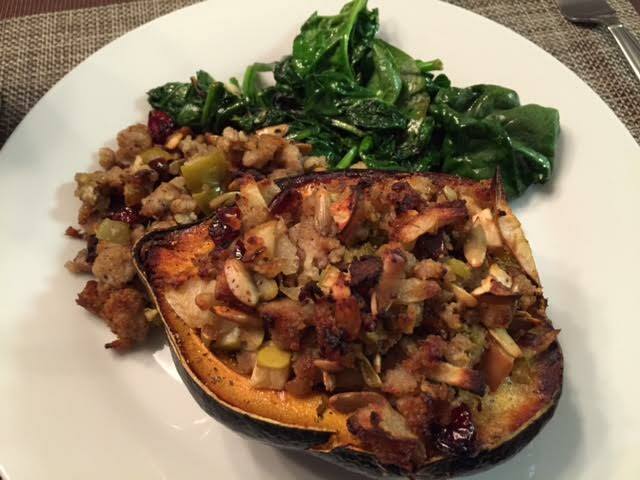 Acorn squash has been one of our favorites this season…if you haven’t tried it yet, you need to! Preheat oven to 400 degrees. Combine butter, garlic, and 1/4 teaspoon sage. Brush inside and outside of each squash with the butter mix. Place the squash on a cookie sheet, cut side up, and roast for 50-60 minutes, or until fork tender. In a large skillet over medium heat, brown sausage. Remove from pan and set aside. In same pan, add onions, celery, and mushrooms and cook for 3 minutes. Add the apples and cook for another 2 minutes. Return the sausage to the skillet then remove from heat. Season with 1/4 tsp sage, salt, and pepper. Stir in panko, cheese, pumpkin seeds and dried cranberries. Add the egg and stir to combine. Divide stuffing evenly among the four squash halves. Bake for another 20 minutes. This entry was posted in main dishes, pork, squash. Bookmark the permalink.